A fabulous week all round, great skiing, snow, amazing food and ski guiding. You really did go the extra mile for us. Thank you. Hilary and Robert. January 2013. Another superb week – powder order for late week and lots of falling over! Many thanks. Chris and Katherine. January 2013. Thanks for another great week in the powder. We have had a super time. See you again next year. Andy and Jacqui. January 2013. My best week’s skiing ever. 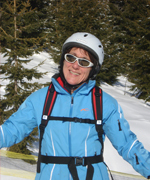 We visited Megeve after many years and much prefer the Espace Diamant. Already booked for next year! Denis and Jackie. January 2013. Thanks so much for a brilliant ‘non-skiing skiing holiday’. You were so considerate to our needs as well as those of the skiers. The recommended walks, cafes, views were all superb. Thank you so much for the fantastic hospitality and 5 star food which was much appreciated. We will be thinking of you all and the beautiful scenery from back in the rainy UK. Sue and Mike Berry. January 2013. After numerous months of planning this special event (Nick’s 50th) we were lucky enough to be able to join Mark, Michelle and Emma in St Nicolas and from our arrival we were treated to the highest levels and warmth from Michelle’s cooking to Mark’s patience on the slopes and Emma contributing to making this an excellent stay. Hope to join you all again in the future. Thanks again. Nick, Debbie, Jack and Chloe. January 2013. Mark, Michelle and Emma. Thank you for making our stay so comfortable, enjoyable and such fantastic skiing. From unsteady on the first morning to blue runs for by the third afternoon in glorious sunshine. Truly unforgettable!! Patrick and Hannah. January 2013. Mark, Michelle and Emma. Thank you for a lovely holiday and not forgetting Tripod. As always, lovely food and lovely company. Alison, Rob, Alex, Isobelle and James. New Year 2013. Fantastic week again. Great food, company and skiing. Won’t be long before Mae is on ski’s too. Pete, Louis and Mae. New Year 2013. Thank you so much for another wonderful week. Great food and great company. I always enjoy coming back. Mark, Michelle and Emma. Yet another great week of food, weather and entertainment to make for a memorable holiday. Thank you Mark, Michelle and Emma for making a fantastic holiday for us all. A beautiful chalet and lovely food. The skiing was wonderful too. Thank you all. 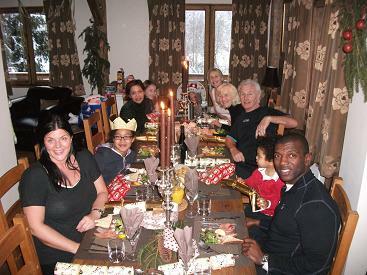 Christmas 2012 will be remembered for being the best to date for us as a family. What a team you are. Michelle, you are a wonderful hostess and a dream chef. Emma is so kind and helpful in everyway. Mark is just fantastic. Every aspect of our holiday was so special. 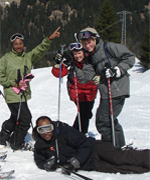 The fun on the slopes and the guidance from Mark has turned our very mixed ability skiers into ski fanatics. The chalet is so comfortable and stylish and our Christmas was amazing. We really do believe in Santa now!! Mark, Michelle and Emma, we can’t thank you enough for your hospitality. Everything was superb. Michelle, thanks for the fantastic food and your lovely friendly self, Emma, thanks for the ski tips and all your hard work making us feel so welcome. Mark, YOU ARE THE MAN! I can’t thank you enough for your brilliant coaching, patience and professionalism, thanks. A spectacular week up in the mountains skiing the best slopes. Chalet still absolutely beautiful and the food gorgeous. Thanks for a brilliant week. Thank you for another wonderful week’s skiing. You have made so much effort to make every aspect perfect every day. Fab food, chalet, fun skiing and great company. Mark, Michelle and Emma. It was fantastic staying with you on this trip. Thank you so much for the hospitality and warm welcome. We look forward to the next time! Ria and Nico. April 2012. Great food, friends and fun. Same time next year! Thank you so much for all the help Mark, Michelle and Emma. Thank you for all your lovely food and thank you all for all of your enthusiasm. Dear Mark, Michelle and Emma. Thank you so much for an amazing week. 6 full days skiing, 6 amazing meals – you are stars! Much love. We have all had such a lovely holiday and really enjoyed our stay in your lovely chalet. Thank you for looking after us so well both on and off the slopes. We would love to return. Patty, Doug, Barry, Rachel, Ben, Mat, Ben and Peter. March 2012. A fantastic week. Brilliant skiing and wonderful hospitality. Thank you so much. Another great week of skiing and hospitality. Thanks very much. A fantastic week again. Amazing food and amazing ski guide. Thank you. Another memorable week. Great fun. Didn’t think we could repeat a great ski week but we did! Thanks for the care and fun. Yet another great week, thanks for all the TLC. Anne and Stuart. March 2012. Another brilliant time. Thank you Mark, Michelle and Emma for your wonderful hospitality. You are a great team on and off of the slopes. Definitely the best place to come for a skiing holiday. Best wishes for the season. Hope to be back soon. Neal and Jane. March 2012. To Mark, Michelle and Emma. Without doubt the best week we have spent on a skiing holiday. The week was a great success, everything we could have wished for and a cook of distinction. Hope to see you again soon. Rod and Jenny. March 2012. Dear Mark, Michelle and Emma. What a great team effort. We think your hospitality is second to none. The whole week has been fantastic from pallet to piste. Best wishes for the future and we hope to see you again soon. Simon and Robin. March 2012. Another fantastic weeks ski. Thank you for a great week of fun, great food and relaxation. Until next time! Claire and Tom. March 2012. 4th visit, need we say more! Another great holiday, fantastic company, wonderful skiing and yet more fab food. Ticked a few more boxes thanks to Mark. Many thanks to Mark, Michelle and Emma. Chris and Deborah. February 2012. Thanks guys once again for a truly fantastic ski week. We all had a fab time on and off of the piste and cant wait till next year. Simon and Tracey. February 2012. Anyone who could make my wife ski a ‘black’ run deserves a medal. Mark’s enthusiasm and guidance is the best. The cuisine is better then good and Emma’s support makes up the team. Great holiday. We look forward to 2013. Noel and Sarah. February 2012. Thank you so much for looking after us so well. We can’t think of anyway our week could have been improved so are already looking forward to seeing you next year. Sue and Paul. February 2012. Fabulous week, one of the best skiing week’s we have had. You looked after us so well. A big thank you to you all. We will be back. Chris and Ann. February 2012. We’ve had such a fab week. Thank you for making it amazing. Niccy and Matt. February 2012. Thank you for an amazing week. Everything was perfect. Thank you for introducing me to powder. See you again. Steve and Carole. February 2012. As always, an excellent week’s skiing with Mark at the helm and Michelle providing Michelin star cuisine and sustenance. Emma is a welcome addition to the team. The attentiveness is better then a 5 star hotel. See you again soon. Mark, Michelle and Emma. Thanks for a wonderful week, fabulous as ever. Thanks for the excellent service and constant dedication. Jack thinks your food is ‘wicked’!! Great praise in deed!! Elizabeth and Jack. February 2012. Another great week’s skiing. Great food as usual and superb accommodation. You make a perfect team. Jim, Carol, Brenda and Alan. February 2012. Another fantastic week – everything was perfect. Mike and Sara. January 2012. Another fab holiday. Brilliant food as usual and the skiing was superb. Thanks for a wonderful time Mark, Michelle and Emma. I’ll be back in 2013. Dear Mark, Michelle and Emma. Thank you again for another amazing week. The food, skiing and hospitality were 1st class. Have had a wonderful time and looking forward to coming back in 2013. Well this is our fourth consecutive visit to you for our annual ski holiday and Mark, Michelle and Emma you never disappoint. A truly wonderful week with ‘True Alpine’. Super snow, super skiing, superb food, super hospitality and yet again another cozy stay. Not to forget the scrumptious cakes. See you next year. Steph and Rob. January 2012. Dear Mark, Michelle and Emma. Many thanks for yet another brilliant week. The snow, weather, food and hospitality were their usual high standard. Here’s to seeing you again in 2013. Michelle, Mark and Emma. Thank you so much for my 1st amazing week with you. Michelle, I have never tasted such fantastic food all in one week. 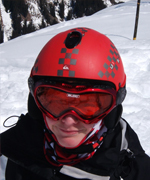 Mark, thank you for all your tips on the slopes and Emma, it was great you could join us each day. Keep in touch. Mark, Michelle and Emma. Thank you all so much for a ‘fab’ time. My 3rd visit and certainly won’t be my last- roll on next year!! Food excellent as always - matched by such friendly hospitality. ‘True Alpine’ is the experience of a lifetime and an amazing team to be part of for too brief a time. Good to be back. Thanks again for a fabulous week. We ordered snow and there was plenty to enjoy. The whole package ‘True Alpine’ offer is great and we love it and we will be back. David and Elaine. January 2012. Thanks for a great week. No doubt another part of the piste will be named after me after my muppet display on the last day! Best wishes for the rest of the season. Thanks for another brilliant week’s skiing. For foodies like us, your meals Michelle and Emma are top notch and we leave with full bellies again!! Thanks for the snow Mark. Powder skiing is improving. Andy and Jacqui. January 2012. Another fabulous week of skiing in great conditions, superbly supported by Mark, Michelle and Emma. Many thanks. Chris and Katherine. January 2012. Superb as always. You made my birthday celebrations memorable. Thank you for your generosity and best wishes for the rest of the season. Denis and Jackie. January 2012. Thank you so much for an absolutely amazing holiday. The children have all had the most fantastic first skiing experience. We can’t thank Mark and Emma enough for all their hard work on the slopes. The standard of accommodation and catering is second to none – truly fabulous. We have no doubt ‘True Alpine’ will continue to be a fantastic success and long may you all enjoy what you do for us holiday makers as your enthusiasm show and makes us all feel so welcome. We hope we will be able to make a return journey sometime soon as it will be hard to settle for anything less now we have had a taste of the high life!! Thank you so so much. The True Alpine team are all fab. The skiing with Mark was amazing. The food was absolutely delicious – Master chef award winning stuff! The Luge – indescribable fun! The Landi - Mr Reliable! The attention to detail – Warm dry boots, lovely soft towels …….. Empty slopes with beautiful views. 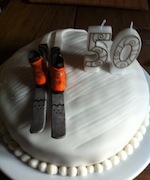 At the end of a long day’s skiing returning to a beautiful chalet with a lovely log fire and yummy cake – ahhh!!! The Levy’s . December 2011. Our thanks for a most enjoyable week. The ski accompaniment was much appreciated. The excellent catering and the genuine host service were especially welcome and much appreciated. Michelle and Mark, you should be very proud of what you have achieved and the guests should be very pleased with the experienced, professional, polished and efficient service. Garry, Theresa, Michelle, Lauren and William. December 2011. The true value of having a ski guide like Mark was perfectly illustrated when New Year’s Day became the best day’s skiing we had ever experienced. Covering 40 kms of the mountain range in brilliant sunshine with a perfect variety of slopes and views. We could never have achieved such a day without Mark’s guidance. Michelle and Emma have been perfect hosts with fabulous cooking, great company and just the right level of involvement. Many thanks indeed. Martyn, Lucy, Paddy and Freddie. December 2011. Mark, Michelle and Emma. Thank you so much for having our family for Christmas. We had a great time with wonderful food. You went to great lengths to make us feel at home. Our grandchildren have had a wonderful time. A family of first time skiers are completely smitten. Sue and Nigel. December 2011. Thank you so much for a lovely holiday. What an amazing way to spend Christmas. 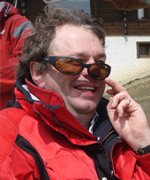 Thank you Mark for your fantastic help on the slopes, we have come such a long way on our first week on the slopes. Emma, thank you for always being my guardian angle waiting at the side of the slopes for Isabel and myself. Michelle, thank you for a fabulous ‘home from home’. Beautiful food and your caring manner made all our children feel very comfortable and at ease. Thank you for all your effort on Christmas Eve. We couldn’t have asked for a more magical Christmas. The toboggan run was great fun too. See you next year. Alison, Rob, Alex, Isabel and James. December 2011. Dear Mark, Michelle and Emma. We can’t thank you enough for a truly fantastic week. We really appreciate the efforts you all went to to make Christmas so memorable especially as it was Mae’s 1st one. The food as always was fantastic. Louise, Pete and Mae. December 2011. Mark, Michelle and Emma. Thank you so much for a fantastic and eye opening holiday. I leave you being able to ski after coming here not even knowing how to put skis on. Meals, hospitality and everything were all 5 star. Can’t wait to come back next year. You have us all hooked! How do you do it? Wonderful chalet, brilliant food and perfect snow. Thank you for helping me to ski and for taking me on obstacles courses. It was fun and I really enjoyed the jumps as well. Thanks Mark. Thank you for a brilliant holiday. You offer something very special and you deserve nothing but success for your unstinting hard work, good humour and your impeccable attention to the needs of your guests. With all best wishes for the future. Mark and Michelle. Thanks for providing us with a great ski experience last week. Asyou realise, the chalet experience almost counts for as much as the skiing but both were excellent despite the less than ideal snow conditions. We have all had a lovely week – Thank you. Despite the snow conditions, we have managed to dabble, straightline, gnarl, become experts at 360’s, hug trees, jump and for some of us, dig ourselves out of the snow. Thank you Mark for making sure that we never had to carry our skis or indeed walk more then 50ft in our ski boots. You have built a beautiful chalet which with the expert culinary skills of Michelle and Jacqi you deserve to be a great success. You really cared for us. A big thank you for a great few days. Fantastic food, superb chalet and brilliant skiing. Thank you Mark for showing us what we are really capable of. We will be back!! Top week, we both loved it. We will be back to see you in the Summer. We both had a fabulous time as your guests this week. Eating, skiing, eating, skiing ….! 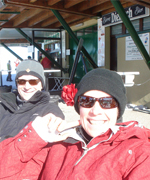 Mark’s encouragement on the slopes made the week for us and Michelle’s care and commitment topped everything off. Wishing you both continued success. We will be back again. What a fabulous week. Your hospitality and hosting skills have been faultless. We have had a superb holiday and without doubt will return for more of the same. Maarten, Espen, Radboud and Daan. Thank you so much Mark and Michelle. This week has been everything we were hoping for. Good snow, good skiing, cosy chalet, nice people, great food and beautiful weather. You made the stay so comfortable that we could concentrate on our skiing. Just do not know what could have been better! A great week. Thank you Mark and Michelle. 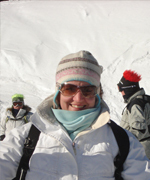 Skiing tips very helpful and I feel much more confident on the slopes. I think I saw much more of the slopes with you Mark then I would have done on my own. The chalet is beautiful, food delicious and attention to detail second to none. It couldn’t have been better. Out third visit to True Alpine, need we say more! Thank you once again for a fantastic week, hope to see you both very soon. On arrival I declared that I had no intention of heading up the slopes everyday. You guys were so amazing that not only did I go up everyday but I was extremely sad to come down again! Thank you for being wonderful hosts and for making us feel so welcome and comfortable and very full!! Mark and Michelle. You are fabulous hosts. You managed to make everything appear not to be any trouble at all! Amazing food, fantastic chalet and we are certainly sold on the ski companion idea – truly converted. 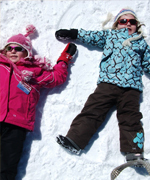 Skiing holidays that are easy even with kids!! Thank so much. We will be back. Thank you very much for a fantastic holiday. Sun, snow, amazing hospitality and mountain hosting. Couldn’t be better. Thank you for all your hospitality, beautiful surroundings, house and super skiing. Thank you for the most amazing holiday. You have been incredible. Look forward to coming back one day! Had an awesome week guys. Thanks so much for making our stay so good. Michelle - Great food. You have great variety, I really enjoyed it. Mark – Thanks for all the banter and patience. Had a fantastic week, it could not have been better! 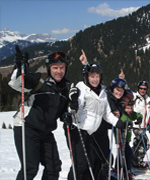 Great skiing, fabulous food, 5-star comfort- a greatholiday all-round. Thank you for all your hard work to make it such!! A great week’s skiing with a good guide and instructor even if we didn’t always do as we were told! We felt at home in the chalet as soon as we arrived and the food was superb. Nothing too much trouble, comfort and good company. Thanks for a wonderful time yet again. Pity the snow was fading fast but well done for finding us great snow for us. Brilliant food as ever Michelle. See you next year. Mark, Michelle and Ben. Many thanks for another excellent week. Weather was fantastic, food was brilliant, skiing was great. Thank you for another fantastic week, hosts, food and skiing fab! Looking forward to next year. A truly glorious week. Michelle, Mark and Ben. Fabulous week. Amazing food, so nice to be spoilt rotten again. Lovely skiing. I can’t wait until my next visit! 5 star service throughout. Thank you all so much. Thank you for your wonderful hospitality, delicious food and meticulous attention to detail. Expectations of a wonderful holiday fulfilled once again. Thank you, Mark, Michelle and Ben. Can’t wait until next year all ready. Thank you for another fantastic week. Can’t wait to get back next year. Thanks for another top week despite no new snow. Despite no fresh snow, Mark managed to find continuous very good runs. Plenty of great sun for January. Great week’s skiing again. Thanks for another brilliant week’s skiing Mark and thanks to Ben and Michelle for looking after me in the chalet. Cheers. Another perfect week’s skiing yet again! Despite the dodgy conditions throughout the Alps, we were in a little oasis of snow. As ever Mark made the most of it. Michelle’s food was peerless once more – she really is the hostess with the mostest. A perfect few days spent in the exceptional company of Mark, Michelle and Tripod! The chalet was great in every respect and the food was as good as any top London hotel. Mark’s ski guiding was a fantastic balance of speed and fun. The boys came on leaps and bounds watching and following and had a brilliant time jumping, racing and falling. 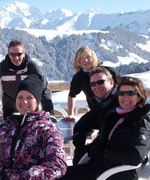 What very kind people with such a beautiful chalet – 7 stars all round. Where do I start? I am not normally lost for words but words fail as the experience that we have just had was truly amazing. The food was a culinary rollercoaster with every meal. Michelle and Mark were the perfect hosts and the chalet speaks for its self. We have some fabulous memories and Tari and Ceri made excellent progress due to Mark. All in all a perfect end to 2010 and a fab start to 2011. Superb all round. Thank you both for opening my eyes to the lower resorts. Mark and Michelle, you are wonderful hosts. The chalet is wonderful and the instruction fantastic. You looked after us so well. Thank so much for a great New Year and a lovely holiday. You have been such welcoming hosts and I’ve really enjoyed ‘winding the windows down’ and chilling in your lovely home. Hope to see you again. What a great week, food brilliant, chalet superb and Michelle and Mark excellent hosts. Looking forward to coming back again as it is home from home. Thank you for a brilliant week. Brilliant everything but the cherry on the cake has to be Mark getting our 2 year old ski obsessed boy skiing. See you again for sure. Dear Mark, Michelle and Jacqi. I did not realise the chair lifts were powered by Marmotts! Thank you for helping me with my skiing Mark and thank you for the lovely food Michelle. Lovely company, lovely chalet, lovely snow, lovely food = lovely holiday. Memories of time spent with family and friends priceless! Thank you for a brilliant holiday and finding some new friends. Mark, I have learnt so much on this holiday and I think I am a bit of a better skier now. Michelle, the food was delicious and I wouldn’t mind having it everyday! Jacqi, you have been a friend and made me laugh a lot. 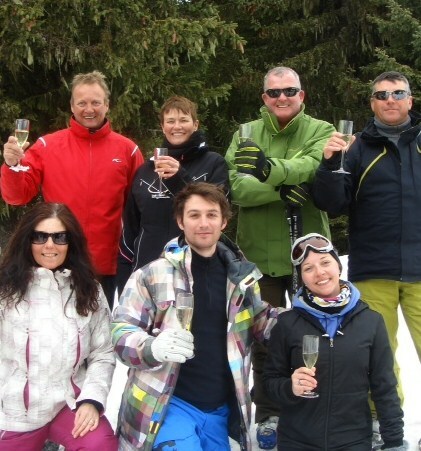 Thank you for one of the best ski holidays I have ever had and I have had a few! Only tears of laughter this time! To True Alpine. Thanks for a lovely break. Michelle, cakes are still fantastic and I can’t believe you are both still in a snow plough! What can we say but fabulous, fabulous, fabulous, everything. Thank you for your patience Mark, thank you for your cooking Michelle and thank you for a great Easter egg hunt Jacqi. We’ll be back. Thank you, Thank you, Thank you! BUT I’m afraid I can’t return as I would soon become the size of a house! FAB cooking, FAB ski guiding and FAB chalet. Sadly, I won’t recommend you to friends as I want to keep you as my best kept secret! Mark, Michelle and Jacqi. Thank you so much for this week. Food was unbelievable and Mark I cannot believe you got me skiing well enough to dodge the Bovrils! Thanks again. Absolutely brill week’s skiing. Mark has been a really wicked ski companion. Michelle and Jacqi have looked after us superbly. Thank you all very much. Great weather all week – 4 days of blazing hot sunshine followed by 2 days of heavy snow. Now sitting in front of the log fire after a hard days skiing waiting for Michelle to serve up one of her gourmet meals. Could life get any better? If heaven is anything like this – then take me anytime!! Such a relaxing week in a beautiful place with wonderful food and a wonderful welcome from Michelle, Mark and Jacqi. Wow, what a week! Everything has been so brilliant. 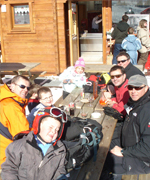 You guys were made for this ski holiday malarkey :o) Thank you for all you have done for us. See you sometime soon. To say we enjoyed ourselves would be the understatement of the century. We really couldn’t have dreamt of a better holiday!!!! Hats off to you all, amazing chalet transformation, delicious food, great company, the list is endless. Now, just need to decide when we come back next year. Thanks for everything guys so so much. Claire and Tom. March 2010. Mark, Michelle and Jacqi. Thank you all so much for a fantastic holiday. You made us feel ‘home from home’. 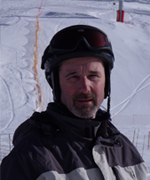 Mark – thank you for all the support with skiing. Michelle – thank you for all the great food. Jacqi – Thank you for all the memorable laughter! We look forward to our next return. Louise and Pete. March 2010. What a fantastic week. Great food, skiing and company. Such a memorable week and tribute to all your hard work. Thanks again. Mark, Michelle and Jacqi. We have had such a great week. The food was wonderful, a lot of hard work. The chalet looks wonderful and the décor makes for a lovely homely feel. Thank you Mark for giving good advice to get down slopes even when they look a little steep! We will look forward to coming back again. Sarah and Jon. March 2010. Mark, Michelle and Jacqi. Thank you all so much for a very special holiday. The chalet and food were first class. Mark you made an excellent ski companion. Thanks again. Neal and Jane. March 2010. Mark, Michelle and Jacqi. This was all so good! A high level of craft in the chalet construction, kitchen creations and ski guidance. We’ll be back and we will tell lots of others. Thank you so much. Steph and Rob. March 2010. Well Mark, Michelle and Jacqi. Once again another fantastic week. ‘Ditto’ all I said last year but even better! Thank you Mark for showing me the light on the ski slopes! Mark, Michelle and Jacqi. Thank you for a wonderful holiday. The skiing, food and hosts are amazing. Looking forward to next year. Mark, Michelle and Jacqi. Thank you for a wonderful skiing week. We cannot wait to come back! What a wonderful time. Skiing, food and company were great and will definitely be back. Mark, Michelle and Jacqi. Certainly my best skiing holiday ever. Perfect conditions on and off the piste! Really appreciate everything you have done to make us all feel so much at home. Thank you so much for the most amazing holiday. “Spoilt rotten” for a week suited me very well! Amazing skiing and great tips from Mark. Will be back for another session! Mark, Michelle and Jacqi. Thanks for a fantastic week. The food was brilliant and the skiing absolutely fantastic. See you next year. Mark, Michelle and Jacqi. Very many thanks for a lovely holiday and amazing food. Your chalet is out of this world. We will tell all of our skiing friends about it. We had an amazing trip, thank you Mark, Michelle and Jacqi. As before, another fantastic week away. Great food, company and skiing. Michelle the cakes were fab especially the lemon drizzle! Thank you again Mark and Michelle for another brilliant holiday. Food once again truly amazing, wonderful company and fantastic skiing. Thank you so much for an amazing holiday. I had a great time. The chalet is beautiful and the food and hospitality is wonderful. I would love to come back. Wow, never expected such a beautiful chalet, quality good and the best hosts I could have expected. Thanks to Michelle and Jacqi for the great food and to Mark for his patience and attention on the slopes. See you next year. Superb yet again. Best food ever. Lovely and clean chalet. Fantastic attention to detail as always. Look forward to seeing you all again next year. Thank you for an amazing holiday. I have particularly enjoyed feeling uncomfortably full every evening! Love your chalet and the atmosphere, can't wait to come back. The chalet is amazing and you have made us feel so welcome - like old friends. Thank you so much for an amazing holiday, we have had a fab time. Thank you for making another family holiday another skiing and gastronomically success. It's been the best week of my life! The food is great. Mark, Michelle and Jacqi, you should be proud of yourselves to hear me call the chalet a 10/10 dream miracle. I have enjoyed every moment and will always remember this holiday. Thank you for looking after me and making me so happy. If Carlsberg did ski chalets, this would be it. 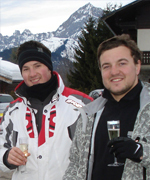 True Alpine, probably the best catered ski chalet experience in the world. Thank you for everything. I have had the most amazing holiday. The combination of excellent food, fantastic skiing and perfect company made for a wonderful experience. Thank you for a wonderful week. It has been so relaxing and fun and you have done lots of lovely things to make us feel so welcome. Loved the chalet, cooking, skiing and company. Big love to you guys. A perfect holiday. Fun, exciting, delicious, relaxing. I shall miss you. Thank you for a superb time. We will be back. Thank you so much for your wonderful hospitality - so generous in spirit. A beautiful home you have created and you welcome your guests to share it as their own. We have had a fantastic week. I couldn't have brought my friends to a better place. Your chalet is so wonderful and your hospitality amazing. See you again soon. Thanks again for another wonderful week. Food, hospitality, afternoon tea, guiding all excellent. Loved it! Thanks for a thoroughly exhausting holiday. Same time next year! Brilliant as ever. Expanding waistline is testament to your lovely food Michelle. Thanks for all your tips and advice on the slopes Mark. Thank you once again for an excellent week. Good ski guiding, food and company. What more could a man ask for! Fantastic holiday, great company, loved the food! Loved everything :o) from beginner to green run in 4 hours, Mark you are a star! Michelle, thank you for the amazing food. Look forward to our next encounter. Firstly, thank you for making us so welcome, it has been fantastic. You have been great hosts. Michelle, you are definitely the hostess with mostest. Your meals are fabulous. It was a pleasure to have met you. Your chalet is lovely and the location amazing. You guys are terrific. I would definitely recommend you and your company. The chalet is absolutely beautiful and the food is fantastic. Loved every minute of the hosting and skiing. for the best holiday ever. Thank you for an amazing time. Your chalet is beautiful and you have certainly found a niche in the market. Lynette and Paul. January 2010. Such amazing food and company. Beautiful views, what a find! My first trip to the Alps and I've had such a wonderful time. A beautiful chalet, amazing hosts and some of the best food that I have ever eaten. Wow, what an introduction to skiing. The chalet is stunning, more than I could ever have imagined. The food was lovely. All in all, the perfect ski holiday. I have loved every minute. Your mountains are breathtaking and your chalet is fantastic. The food without saying was exceptional. Thank you so much for a fabulous week. You have been so kind and attentive and given us a very relaxed holiday. Your ever present smiles have been a delight along with the great food and the patient guiding. Well, what can we say. Marvellous, perfect, fabulous. It has been a wonderful week and Bertie and I have enjoyed it immensely. Your attention to detail has been superb and we will certainly be back. You deserve to succeed and wish you all the very best with True Alpine. Sarah and Bertie. January 2010. Thank you very much for such a lovely holiday. Your chalet is beautiful. Mark's guiding was very enjoyable - he was so patient and kind. The food was amazing, I have never eaten so well! All of our needs were catered for and nothing was too much trouble. Thank you so much for such a wonderful week. Anton and Paul especially enjoyed the off piste skiing. We had a fantastic time on New Years Eve in our 70's fancy dress outfits and really enjoyed skiing in them on New Years Day! Sam, Sally and Tom. Dec 2009. Thank you for another fab week. Wonderful food as always and masses of fun. Thank you for allowing us to share your beautiful home in France. Your hospitality, kindness and thoughtfulness have ensured that we have had a truly wonderful Christmas. Mark has been so patient with us on the slopes for which we are truly grateful. Michelle, your cooking is superb! As always an awesome holiday. Sun, skiing and salmon, perfect! It was lovely to see 'True Alpine' in its new found glory. Can't wait to return. Sally, Sam and Tom. April 2009. Thanks for an amazing week with endless laughs and brilliant company. 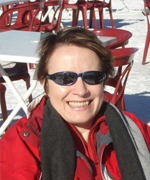 Michelle's food was a constant delight and your beautiful chalet so comfortable and welcoming after a hard days skiing. Thanks Mark for being so encouraging and moving our skiing on considerably - you truly inspire confidence. We go home happy aching and glowing. Hope to see you soon. Sam and Frank. April 2009. Thanks for an amazing stay at your beautiful chalet. Wonderful food, great company, good snow and sunny days. Looking forward to next year's trip. Elissa and Sasha. March 2009. Deborah and Chris. March 2009. Thank you for a fantastic week. Chalet and food 1st class and excellent company too. 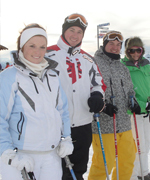 Ski guiding service absolutely brilliant, we were guaranteed a great day out regardless of the weather conditions! Thanks again and hope to see you next season. Caroline and John. March 2009. What a great week, worth flying all the way from Dubai for. Great company, wonderful food, fed like a king and perfect ski conditions. Caroline and Sau. March 2009. Can't thank Sadie and Donna enough for recommending this ski haven to us. 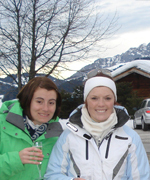 It far exceeded our expectations and you made it such a wonderful experience for us, skiing, meals (especially cake!!) and just general hospitality. We will be back for sure. Steph and Rob. March 2009. Thank you for looking after us so well both on and off of the slopes. We are in awe of your mountains, their beauty and their endless supply of superb skiing. Your chalet is a true 'Masterpiece' welcoming us and your hospitality and cuisine second to none. Mark and Michelle you cannot fail to succeed, you're wonderful! As always, wonderful food, drink, skiing and absolutely brilliant company. Can recommend the pub up the road! Snow was excellent complimented by Mark and Michelle's natural flair. See you next year. The lion and chimp. Wonderful chalet, fab food, great skiing, what more could we ask for? What can we say, this is truly the best chalet that we have ever stayed in and have been treated so special. We have felt so at home. Mark and Michelle are the nicest people we have met, so caring and confident. The chalet is wonderful in everyway, food excellent and ski guiding heaven!!! Can't wait to return next year. Tim, Anita and Oliver. February 2009. Thank you so much for a fantastic week's skiing. The food was amazing, the snow and companion skiing was just excellent and a very enjoyable experience. It was great to do my first red, thanks Mark. All this from a superb chalet, it was a pleasure to stay. Oliver loved the snowman!! We will definitely be returning. Thank you both for a lovely week. The food was truly fantastic every evening and the hospitality and cleanliness wonderful. May we wish you every success in the future. It was our pleasure to have stayed with you. Accommodation amazing, food fantastic, stunning snow. Thank you for a holiday that our family will always remember. This has been a super week and my favourite skiing holiday so far. The chalet is amazing and you guys are excellent hosts. Will miss you until next year. Sarah and Martin. January 2009. We had a lovely week. Fantastic chalet, beautiful skiing and great food. Can we come again next year please?! 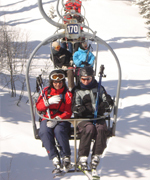 What a week, ski guide system and transport to the slopes excellent and flexible. Food and accommodation second to none. You go the extra mile to make the whole alpine experience first class. Looking forward to another visit. Mick and Dawn. January 2009. Never trust a ski guide who wears full body armour, head protection and ribbons on his skis. We did and it was awesome!!! Thank you Michelle for the fab food. The best chalet we have ever stayed in. Thank you so much for a brilliant holiday. The chalet is absolutely stunning and the beds are so comfy. The skiing was brill, thank you so much for helping us improve Mark. Both of you made us feel so welcome and Michelle your cooking is divine. Definitely will be coming back! Fantastic holiday, best I have possibly ever been on! Will definitely be coming back to this gorgeous chalet and Michelle's lovely cakes. The nicest, loveliest, prettiest most homely chalet ever with the best staff/owners around. Mark and Michelle you are genuinely such nice people and have made our holiday so good. Kerry and James. January 2009. An amazing haven providing a special retreat. You have been the best hosts and I couldn't think of a better way to spend the New Year. Thank you so much. I can't wait to come back. Great food, lovely people and fab experience. Thank you so much for a completely wonderful stay over the Christmas. The chalet is beautiful, the food and wines excellent and yourselves as hosts and guides went well beyond our expectations. Chris and Alison Wilson owners of the Balmer Lawn Hotel, Brockenhurst, New Forest. I may not be the best skier in the world, but I love it! Without doubt Mark and Michelle offer something truly unique – Mark's passion for skiing is infectious whatever your level or age. We have been lucky enough to ski in some of the best resorts in Europe and Canada, but we have been back to Mark and Michelle's three times since they first opened for business, my fourth trip is already booked! The chalet is beautiful and well appointed and kept in top order by Michelle, a brilliant cook as well, ensures you will never go hungry. The Bar a short walk up the hill is like going back in time (in a good way). Don't be put off because this is not a "ski-in ski-out" proposition – Mark knows the mountains like the back of his hand and he takes you to the most suitable location for your ability and the given conditions. "Don't suffer the rest when you can have the Best". 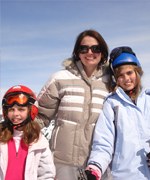 We have three Kids – Polly 13, Henry 12 , Amy 10, they all love Mark and how his little challenges stretch their ability but in a very safe way, skiing is always fun for kids but skiing with Mark is "Brilliant" sorry "Awesome"!!!! True Alpine is a true 5 Star skiing experience. 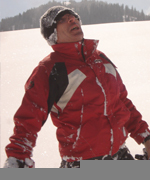 Mark exudes enthusiasm and passion as both a guide and ski instructor. 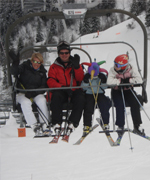 He has taught our three children to ski and they now say they prefer snow holidays to the sun…! The chalet is immaculate with an ‘alpine boutique’ feel to it. Michelle is an exceptionally talented host and her cooking is EXQUISITE! 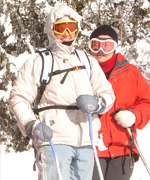 Flumet has so many resorts to choose from and you are always assured of snow. We love it so much that this season will be our third year with them….and long may they have space to accommodate us! Thank you Mark and Michelle! True Alpine in the Espace Diamant has been a wonderful discovery. It's tempting to keep the picturesque scenery, the varied yet quite runs and superb snow a secret, but having enjoyed two brilliant holidays we feel we must share this fabulous experience. Mark and Michelle are prefect hosts for whom nothing is too much trouble. 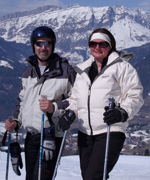 Whilst Michelle ensures your stay at True Alpine will be unforgettable, Mark is busy offering a Ski Companion service. He escorts you through the magnificent mountains and makes sure you get the very best out of your day, regardless of your skiing ability. Just when you thought your day could not get any better it's topped by a splendid evening meal in their luxurious chalet. Perfect. We have spent many weeks in Megeve and often looked over the valley to the nearby resorts and wondered… Two years ago we took the plunge and are now sold on the area. This is due in no small part to True Alpine with their fantastic chalet and hosts Mark and Michelle. Michelle’s food is superb and Marks guiding a revelation. Megeve is not busy outside the holiday period but seems as busy as the 3-valleys compared to the Espace Diamant. We have skied in many resorts in Europe and Canada but True Alpine is a place we will always try and come back to. The Gillam family from East Grinstead. The beautiful Chalet Les Colombes is the perfect setting for any family to enjoy a skiing holiday in a truly lovely setting. The chalet is tastefully decorated to the highest of standards – everything has been thought out so carefully to ensure that everyone enjoys the most comfortable of surroundings. Michelle, Mark and their staff are the most perfect hosts. It doesn’t matter if you are an experienced skier or a complete novice. Everyone in our party made progress and felt that they had really achieved new skills during their stay at St. Nicolas La Chapelle. On our daily return from the slopes, we all enjoyed another tasty cake that Michelle had baked during our absence. Our family became part of Mark and Michelle’s family when we all sat down to a wonderful three course meal with fine wines in the evenings. A perfect end to a perfect day! We would thoroughly recommend that you visit the Chalet Les Colombes. You will not be disappointed and you will come away feeling that you had really had a truly fantastic experience. Thank you Mark, Michelle and Emma. I really enjoyed your food. You always make me feel at home and the skiing was amazing. You are all very nice. Thank you for looking after me on the slopes. I absolutely love your brilliant chalet.